The Covi SuperShow Rally will be held in the picturesque surrounds of the Ellerslie Racecourse. The Rally is the perfect base from which to explore New Zealand’s premier motorhome and caravan show at ASB Showgrounds. To make it easy and hassle free the Covi SuperShow will be providing regular and free buses to take you to the Covi SuperShow venue throughout the day. 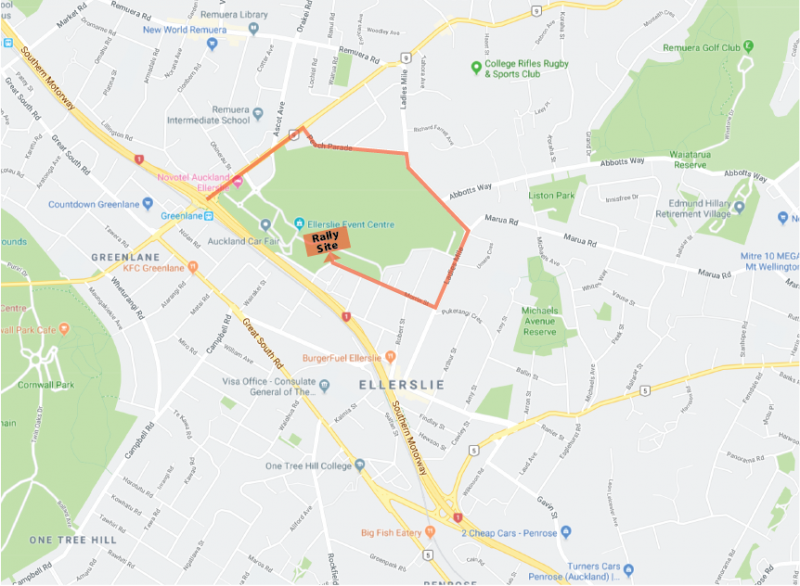 Please Note: The Rally location has changed within the Ellerslie Race Course - there is a new entry point (to view as a pdf please click on the map). If you are coming from the north turn left off the motorway at the Greenlane Exit. If you are coming from the south turn right at the Greenlane Exit. At the third set of lights turn right into Peach Parade (at the Mobil Station). Travel to the end of Peach Parade and turn right at the lights into Ladies Mile. Turn right at the second set of lights and continue on Ladies Mile. Take the second right down the hill onto Morrin St. Continue down to the left hand bend in the road and the venue is on the right. The location of the Rally at the racecourse has changed. New Entrance to the Rally – via the corner of Morrin St and Mitchelson St.
NO PETS – unfortunately as this is a race course, we do not have the ability to have pets on site. There are no exceptions to this rule. Free transport to and from the Covi SuperShow – we will be providing free buses to take you back and forward from the rally and the show. This is a pack in pack out rally – we will not have rubbish facilities, there is no dump station or water available, and we will not be able to provide power. Gates open from 12pm on Thursday 14th March. The cost is $15 per van per night. There will be restaurant and bar facilities available in the Cuvee Lounge of the race course. The rally is a great place to base yourself from for the weekend. It is close to bus and train lines so it is easy to pop into Newmarket, Parnell or the CBD for a bite to eat or a movie in the evenings. We would love to see you at both the Rally and the Covi SuperShow.